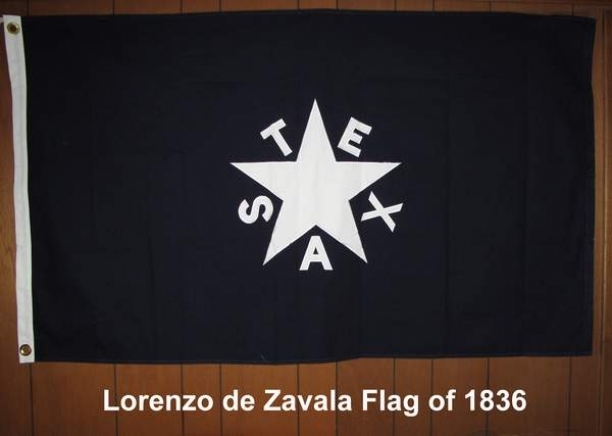 The first official flag of the Republic of Texas, designed by General Lorenzo de Zavala, was adopted by the Convention held at Washington-on-the-Brazos, May 11, 1836, shortly after the victory at San Jacinto. This flag had a blue field with a white five-pointed star in its center. Around the star were the letters T-E-X-A-S. The flag according to minutes of the Convention, was officially selected, first by a committee of five of Texas first citizens, and then by the Convention, but there is not authentic written evidence that it was ever displayed. It was, at least officially, the first flag adopted by the new republic, and was one of the most attractive of the many designed by early Texans. The Third Congress of the Republic of Texas held in Houston, on January 21, 1839, officially adopted as the national flag of the new republic, the present Lone Star Flag of Texas. President Mirabeau B. Lamar signed the resolution into law on January 25, 1839. General de Zavala at one time was a citizen of Mexico and a member of its congress. Later he was private secretary to Santa Anna. He was a leading factor in compiling of the Mexican Constitution of 1824 but joined the Texan forces when Santa Anna repudiated the Constitution. Because of his great aid to the Texas cause, he was made the first vice-president of the Republic of Texas. 100 % Satisfaction Guaranteed. Fully refundable for 10 days upon receipt. 16”X24” Cotton, Cut, & Sewn.